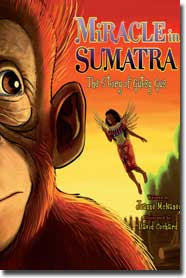 In Miracle in Sumatra, Gus discovers his parents have been trapped by hunters who have come to Sumatra to hunt the orangutan. With the help of his friends, Maya, a little girl, and Gabriella, the guardian of the jungle, Gus sets out to save his parents and teach the trappers about the importance of their natural habitat in Sumatra. 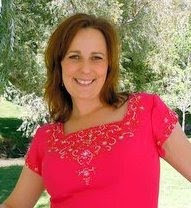 Jeann Mcnaney currently resides in Old Greenwich, Conn., with her husband and three young children. Her first children’s book, The Legend of Honey Hollow (Ovation Books, January 2009), introduces children to environmentalism and the dangers of global warming. She has served on the board of Pathways, Inc., which provides housing for mentally ill adults. She currently sits on the board of governors for the We Are Family Foundation and is an active volunteer with the Old Greenwich School. I was excited to be able to review this hardcover book! What a great story! I want the cute ape in the story for a pet! I loved when the angel helps the kids! I enjoyed reading this book and the love I felt when reading it! I get to give away one hardcover copy of this book to a lucky winner! Giveaway ends on Tues. Jan. 19th, 2010! That ape is cute! I would love to read this to my kids! I read children's books to my kids at night, and my hubby likes to read a little older chapter type books. This looks perfect for bedtime reading. Of course you got my vote Shauna! Your blogs are the BEST! Just clicked on the button and voted for you! Button Button I have your cool button! Follow this blog and your others too! This sounds like a cute book! Count me in. I am a follower on google friend. What a cute book - thanks for the giveaway. I follow - Neas Nuttiness or Libby's Library. Thank you for the giveaway. We love kids books here! Sounds like a great one for us! Lovely book for the kids. Clean nice and wholesome. My grandson would like this! I shared insights on your giveaway on Twitter too! Forgot to say what a nice book review. Sounds like a lovely book! Sounds like a beautiful story. This year I am saving up all the books for kids I win to give to the disadvantaged children at Christmas. Hope I win this one! Miracle in Sumatra would be perfect for my kids! This book would be great for my son. 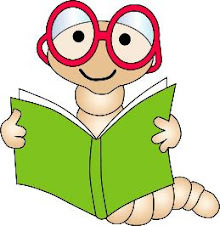 He loves to read. I'd love to be entered for this great book. Wonderful site, very informative and sure to inspire my creativity. I truly need some new ideas for my little creatures. Let's see, comment, follow, try the button thingy and so on. Very cute. I would love this! This looks like a beautiful book. I would love to add it to our collection. Thanks so much! My granddaughter would love this book. This book looks and sounds adorable. Thanks for the chance at winning it. What fun! I'd love to win! I would love to win this for my grandchildren!